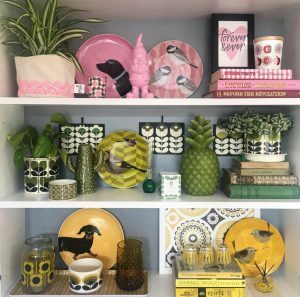 *This month’s Home Expert is Soozi Danson, shelfie expert and the winner of our 2018 Styled By Me competition. She’s here to give you the low down on all things shelfies, including what they are and how to create your very own. Let’s start simple: what even is a “shelfie”? Of course, people have been displaying their knick knacks on shelves for years, but these days it’s become more of an art form. 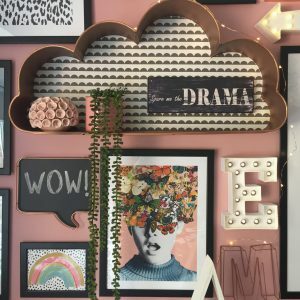 It’s not only a good way to give the impression that you’re “down with the kids” on Instagram, but it can also be a really fun and relatively inexpensive way to create a focal point in your home. Just follow these few simple steps and you too could be the proud owner of an Instaworthy shelfie or two. Find yourself a shelf! Pretty much any shelf will do the job. You may have a bookshelf jam-packed with books gathering dust and that are seldom read, or perhaps a solitary shelf over a radiator in the hallway, which serves as a dumping ground for junk mail and unopened bank statements. Perhaps you’re lucky enough to have some shelves that are purpose built for displaying your collectibles, or maybe you’re actually a shelf-less home and now you’d like to invest in some. You needn’t spend a fortune, as small wall-hung display shelves can be picked up for a relatively low cost from various high street stores. Of course, a shelfie doesn’t have to be on an actual shelf! Any surface will do: a windowsill, the top of a cupboard or chest of drawers, a mantle piece or even the seat of an unused chair. I personally am a huge fan of colour-themed shelfies, as I have a penchant for displaying all my worldly goods in a colour-coded fashion. If colour isn’t really your thing, try grouping similar items together, such as glass, animal-themed items or even anything gin-related (that’s another one of my favourites!). You may just fancy displaying a few items that have special memories; that’s fine too. On a shelfie, anything goes! Next, it’s time to curate the items that are going to go on your shelfie. Start by searching the house for anything you may already own that will go with your chosen scheme (bearing in mind that size matters, and they must also fit onto your shelf!). Charity shops are also an ideal place to buy inexpensive and often unusual curios to add to your display. Try to use all the space you have available. Not just on the shelf, but also around it and behind it on the wall or the back of your unit. This will give depth to your display. After gathering all your treasures, you can start arranging your shelfie. Try propping, piling and pinning. Stack similar-coloured books and use real or faux plants to add interest. Shuffle it around until you’re happy with it. Now it’s time to step back and admire your shelfie-styling skills! Whether you’re going to share your shelfie on social media or just have it for your own enjoyment, the beauty of a shelfie is you can change it easily by just swapping around your display as often as you choose. 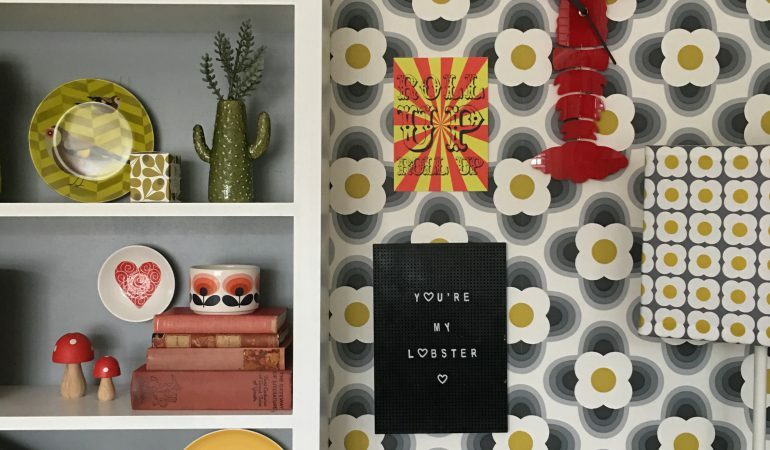 Soozi Danson is an interior design lover and creator of the blog The Patterned Palace. Her very own shelfie won Anglian’s Styled By Me competition in 2018. Follow her @soozidanson on Instagram.